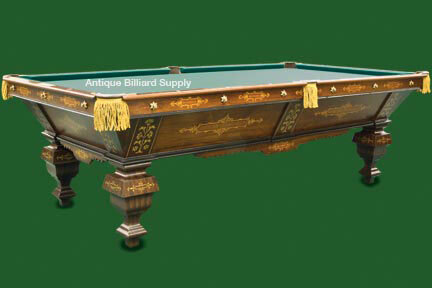 #3-02 Exceptional Brunswick antique pool table of heavily figured walnut burl. Unusual design exhibits dual artistic mediums. Constructed in the 1880s, this table features extensive hand inlays of multiple exotic woods on the cabinet and rails. Diamond sights of genuine ivory. Nine-foot size with Vermont slate playing surface. Completely restored, ready for immediate delivery.